But each of these wineries also has a very clear personality (you can call it a brand, but it's more than that). 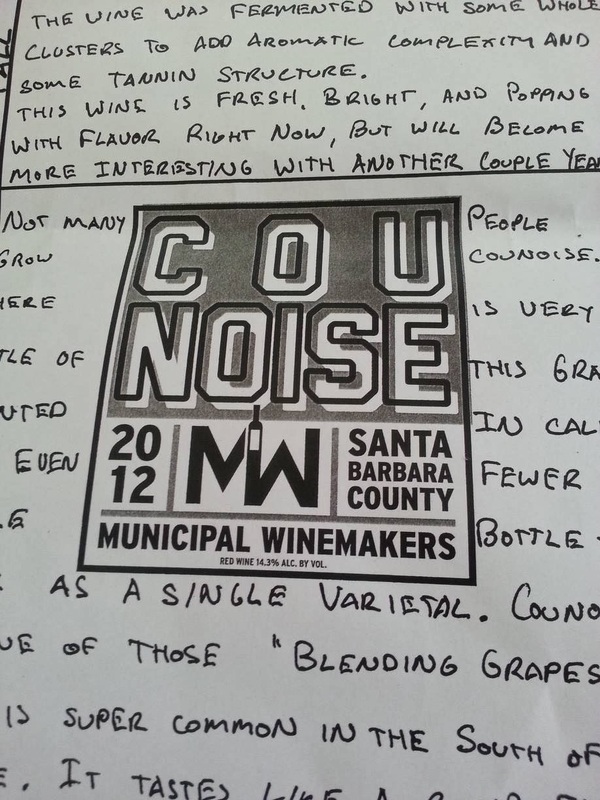 These personalities aren't "put on" or "invented" by the wineries as gimmicks to attract a certain kind of audience. They attract an audience based on who they are, how they present themselves, and how they make their customers and members feel like "part of the gang." Take Saarloos & Sons. 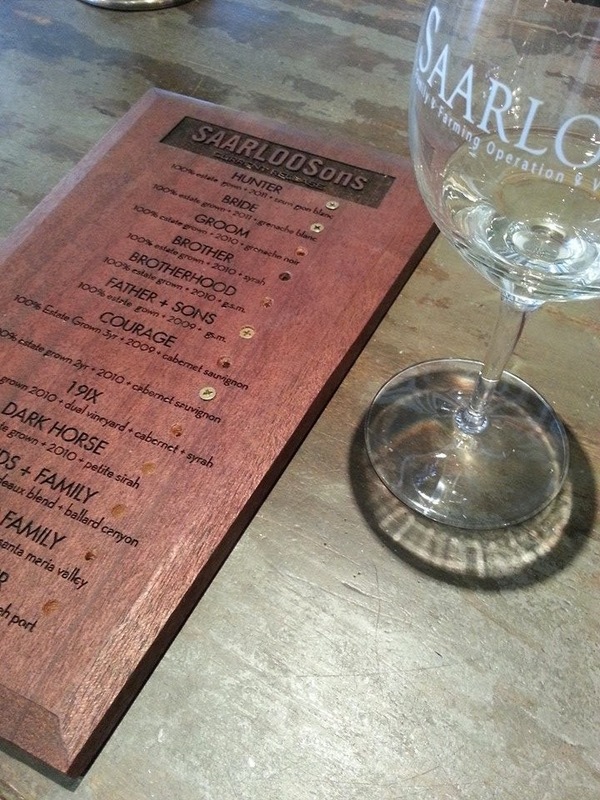 This is their tasting room menu, below. Each wine season, there's a new menu, a new design. This year, a wooden board is labeled with their wines, and a screw inserted next to the wines that are available for tasting. The first time I went to the tasting room, the menu was a fully bound book, with family photos identifying each wine. Many of their wines are made in honor of and named after family members, and there's lots of nostalgia in their tasting room and on their labels. Next is a recent e-mail I received from them regarding a shipping special. Not every company would be comfortable making this kind of innuendo, but it's no big woop for Saarloos. If you're their customer, you "get" them. Now take a look at Municipal. 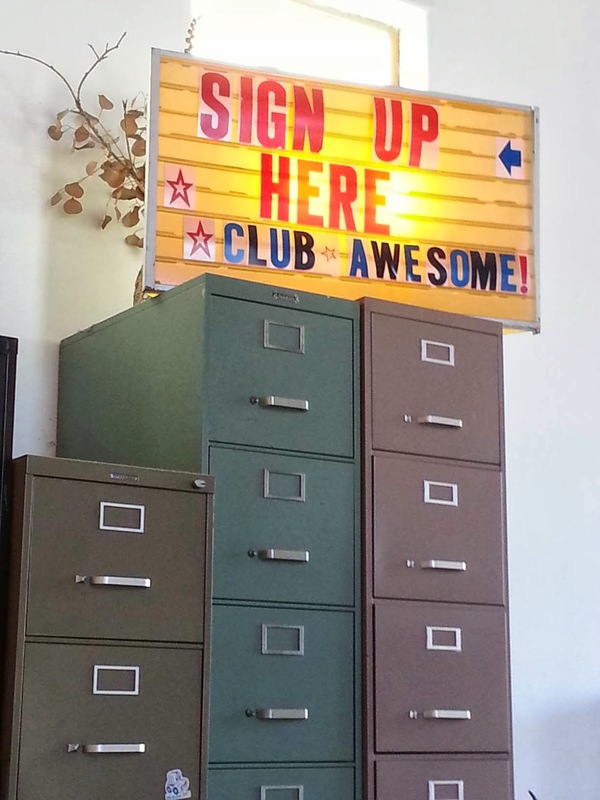 They store glasses and other equipment and tools of the trade in one of eight or ten filing cabinets against the back wall of the room, the first thing you see when you walk in, along with the cheesy marquee inviting you to join Club Awesome. 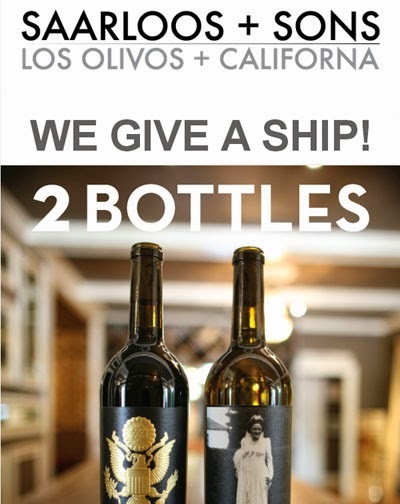 Below is the information sheet that came with one of our wine shipments. Handwritten, handmade, not slick, not "designed" in the formal sense, this is the feeling you get when you walk into the Municipal tasting room. It's funky, it's casual, you don't have to impress anyone. 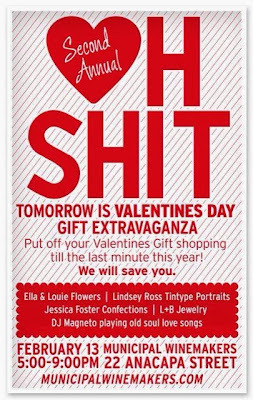 And I would be remiss if I didn't show their recent Valentine's Day pop-up boutique title. This is a clear fit with their personality, and if you're already part of their fanbase, this doesn't phase you. If this does phase you, then you're probably not their ideal customer. What does this mean for you as a speaker? Wine is a competitive business in our county. There are over 100 wineries, multiple tasting rooms and restaurants and markets that specialize in local wines. Yet Municipal and Saarloos are standing out, not just because of their excellent product, but because they have personality. They have flair and an identity that is clearly seen and felt. They are unique and fresh and individual. 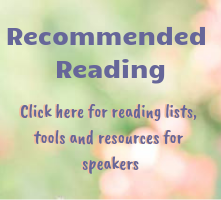 How many speakers, coaches and other professionals are out there talking about your topic, leading programs, offering teleseminars? What are you doing to differentiate yourself and to stand out among them? 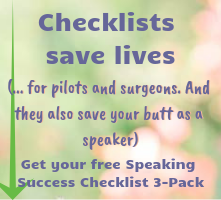 Are you playing it safe because you fear not getting speaking engagements? Or are you rising up, speaking up, expressing your style and personality, and drawing clients and audiences to you -- not just because of your message and content, but because of your authenticity and individuality? Do you know what makes you unique? Share in the comments! Thanks for noticing....it's nice when people get it. Thanks for reading, Keith! Hope to be back soon! The best sales, persuasion, presentation and branding advice is still two words: be you. And now I want a Club Awesome sign too. Fun true tell, thanks! Thanks for reading, Shawn. Isn't the Club Awesome sign great?